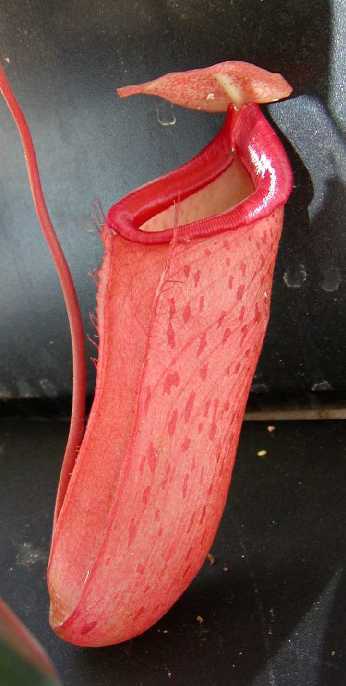 Nepenthes macfarlanei x N. ventricosa is hybrid between two highlanders. I primarily bought this plant because hybrids that involve N. ventricosa are hardy and relatively quick growing. They also get the pinched in waistline that can be quite attractive in some hybrids. The newest pitchers are a dark red to maroon with a little bit of spotting. Why this hybrid is so red is a bit of a mystery to me. Even N. ventricosa "red" isn't quite as red as this hybrid and N. macfarlenai definitely isn't red. So the coloration thus far has been quite surprising. This plant was a larger plant when I bought it originally and suffered no shock or pitcher loss when placed in direct sunlight outdoors. I usually acclimate my new arrivals under some shade cloth for a few months before moving them into direct sunlight. However I was cramped for space and didn't have any more room for this guy so out he went! This plant is doing well and needs a minimal amount of attention. I haven't seen any photos of larger plants yet, but that could change as Exotica Plants updates their website with their hybrid photos regularly. This hybrid would make an excellent starter plant for outdoors or as beginner's Nepenthes.